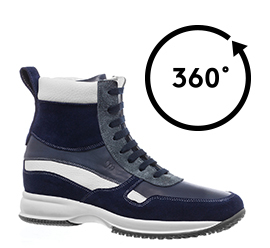 High sneakers handmade, super stylish and able to add 2.4 to 4 extra inches to your height, feature a characteristic upper in soft calfskin with a mix of 4 different colors: white, blue suede, buffered blue and light blue suede. The outsole in 100% natural rubber, super lightweight, offers maximum balance and lastingness. An "Urban Chic" look ideal for casual Street Style outfits.